Here is part 2 of my Halloween weekend. 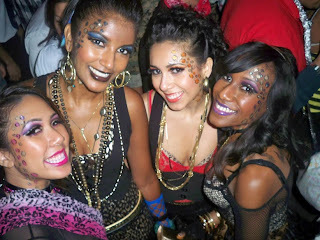 I was a little pooped from the night before, but we still wanted to do it big for the actual night of Halloween. My girls and I always love to do a group costume, and this year we knew we wanted something animalistic...we decided to be the Cheetah Girls. For those of you who don't know, the Cheetah Girls are a Disney girl pop group...but we jazzed it up by actually wearing Cheetah Spots and Leopard/Cheetah clothing. It took about 4 hours for everyone to get changed, made up, and hair done. Yowzers! Here is the final product. Don't we look like a girl group? Our costumes are a collage of all the leopard/cheetah print and funky pieces we could find from all the girly stores like Forever 21...Charlotte Russe...etc. The boyfriends also joined in on the fun. 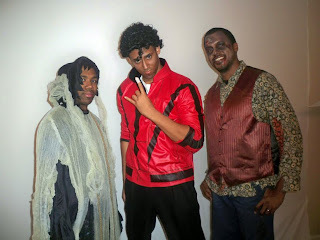 Here we have a Goblin, Michael Jackson a la Thriller days, and a zombie. 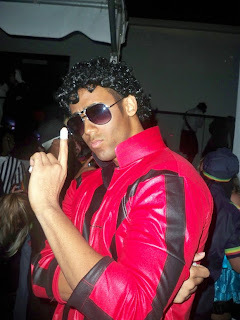 I did the makeup for the boyfriend and his MJ look. I used MAC face and body to darken him about 3 shades (this was when Michael Jackson was a little more chocolate) and made him shave off all his facial hair so I could do some real contouring and highlighting. For Jon (zombie on the right), I pretty much recreated the zombie look I did on the BF the night before. The BF and I at the club. It was freezing outside and so packed! There were 4,000 people that showed up and the whole night was pretty much like a mosh pit, lol. The BF's costume was a hit! 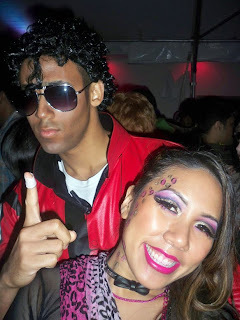 So many people took pics with him because he really did look like MJ. Me and the Girls. I don't think people really knew what we are, lol, but at least we looked cute! I forgot to draw on our noses and whiskers dots, lol. Someone thought we were dominatrixes! He really got into character, lol. Here I am at the end of the night - cold and tired, lol. In the end though, it was worth it. Can't wait for next year! You guys look great! Great Job Ren! great job!! you look amazing Ren!! The Cheetah Girls!! I love it! you are one hot mama! 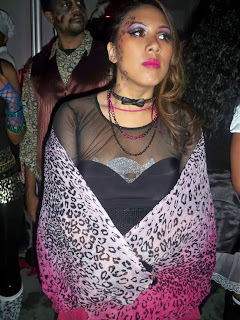 you go cheetah girl! and i love that michael jackson look! he looked so real!